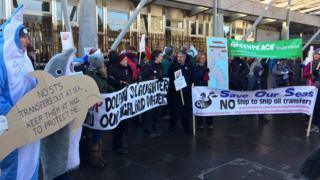 A protest has been held outside the Scottish Parliament to raise awareness to opposition to plans for ship-to-ship transfers of oil in the Moray Firth. Cromarty Firth Port Authority wants permission to transfer millions of tonnes of crude oil at sea. Campaigners around the Moray Firth said the risk of an oil spill would be catastrophic to the marine environment. The port authority said it "fully appreciated" the environment it operated in was "extremely special". The demonstration outside the parliament building in Edinburgh was supported by Green MSP John Finnie, SNP MSPs Kate Forbes and Gail Ross and Scottish crime writer Ian Rankin. The author told BBC Scotland: "I know Cromarty and the Black Isle very well, I've been going there for years. I know the people up there and nobody wants this. "It could be disastrous. One accident could destroy the ecosystem, or set it back decades." Some of the protestors wore dolphin costumes. The Moray Firth provides habitat for a population of bottlenose dolphins. People opposed to the plans held a demonstration in Nairn, a town on the Moray Firth, in December. In parliament, Scotland's First Minister Nicola Sturgeon said "on the basis of certain information" the Scottish government "is unconvinced that ship-to-ship transfers can or should take place". Permission for the transfers has been sought from the port's regulator the Maritime and Coastguard Agency. The agency is assessing the application in consultation with Scottish Environment Protection Agency, Scottish Natural Heritage, Marine Scotland, Highland Council and the RSPB. The port authority said ship-to-ship transfers would help its development plans. It said it was aware of the need for it to protect the environment. A spokesman said: "We believe that people have the right to protest, and it is only fair that our stakeholders are confident we look after their environment. "The port has modified its application in response to the concerns raised over the past 12 months, We fully appreciate that the environment in which we operate is extremely special, and we are legally bound to protect it." The spokesman added that ship-to-ship oil transfers have taken place safely in the nearby Cromarty Firth for more than 30 years. He said: "More than 175 million barrels of oil have been transferred safely in the firth in that time, with no spills. We have the trained staff, necessary facilities and contingency plans in place to ensure these activities continue to be undertaken safely."